Love & Friendship is one of those films that works as a fun time-passer, but starts to crumble under scrutiny. Truth be told, there's not much of a story here. While plot isn't the most vital part of a film (trust me, I know that, Boyhood is one of my favourite films), any film that does concern itself with plot therefore needs to sustain that interest. Love & Friendship clocks in at bang on 90 minutes (excluding credits), and that's a great thing - any longer and it would have cracked completely. The lack of story doesn't seriously damage the film, rather it just pushes it into monotony in its final act as we start realising that we've seen the same scene many times now. As well as this, the characters' emotional complexities are perhaps too hidden. The film's female characters are all fine, but the male ones (namely Reginald DeCourcy and James Martin) lack the conviction and interest that their peers have in abundance, despite their pretty great performances. And that is what the film does use to its advantage: performance. Every actor in this film is clearly having a blast, and it shows. It's infectious. Whenever James Martin bursts onto the scene, you'll smile. He is a flawed character, but you'll smile nonetheless. Lady Susan Vernon, though, is the film's clear highlight. Kate Beckinsale is terrific here, letting Susan's icy tongue and venomous words roll out of her mouth with sheer delight, but perfectly pulling back whenever the film needs a more subtle response from her. She handles her character's tonal shifts with ease. The film's script is great, too. While the story may struggle to reach the finish line, every word spoken in the film is flawless. It packs a high number of big laughs and an even higher number of small ones, keeping you entertained until it cuts to black. This is as old-fashioned as they come, but director Whit Stillman injects the film with a refreshing nod of self-awareness. There's a lot of fun to be had here, it just needed a bit more work to keep it as interesting as it is enjoyable. To Summarise: Witty, funny and delightfully sharp, Love & Friendship overcomes its small but frequent issues and finds a fantastic performance from Kate Beckinsale. Films about people with a disease or a disability come around fairly often. The Fundamentals of Caring, a Netflix original feature, tackles that story. For a while, it has a lot of energy and a lot of quirky detours that hint that maybe, just maybe, this could be pretty great. As the film proceeds, it does lose a lot of what makes its first act so great, but there's still so much to like here that you'll be willing to stick it out. The cast give uniformly great performances. On offer we have Paul Rudd, Craig Roberts and Selena Gomez, all of whom are wonderfully natural in their roles. The script has a solid number of big laughs, and the cast land all of them. The Fundamentals of Caring begins with the potential to shake up the formula a bit. Montages of Trevor struggling with simple tasks like going to the toilet succeed in proving that being disabled is legitimately tough, but we also get to see him have fun with Ben (his caregiver) and pull pranks on him. It strikes that balance nicely. Eventually, the film hits its key sequence. Trevor meets his Dad for the first time since he was three years old. Admirably, the film finds a deeply saddening little twist within this conventional scene that manages to shift the emotion fully onto Trevor and away from his estranged father, but then it blows it. It takes the intricate emotional complexity of Trevor's experience, and throws it all away with a cheap "You're not trying to help me, you're trying to help yourself!" line. It's seriously frustrating, because the film finally shows signs of heading back to its emotionally balanced opening act, but then resorts to dull clichés. Later, the film reveals Ben's previous trauma - and it's actually rather sad - but then splices the footage with yet a sequence so melodramatic that the effect is almost laughable. This is a decent film that had a real shot of being a great one, but it just doesn't get there. It's very similar to The Fault in Our Stars, but what that film had was a pinpoint accurate understanding of its characters and their emotions. Everything was handled delicately. Even the humour (which is great) fits the mood of each scene. The Fundamentals of Caring targets the same effect with a much more laid back approach, and loses a lot of interesting stuff along the way. To Summarise: Impressively natural performances and sporadically great humour make The Fundamentals of Caring an enjoyable indie-drama, even if it fails to stand out amongst a number of its infinitely more thoughtful peers. Tell me if this sounds familiar. A man is alone on an island and about to kill himself when he notices a body has washed up on the shore. He halts his suicide and runs over to it, but the person is very much dead. Then the corpse starts farting. Within five minutes, the man is riding the corpse through the sea like a jet ski, with his heightened flatulence acting as a makeshift engine. If it doesn't sound familiar (and I'd really hope it doesn't) that's probably because Swiss Army Man is the most unique film of the year. In an age of remakes, franchises and sequels, Swiss Army Man is a wonderful breath of fresh air in that there is simply no other film quite like it. The man, named Hank (Paul Dano), begins to bond with the corpse (Daniel Radcliffe), and eventually the corpse slowly comes back to life. What follows is incomprehensibly stupid - there are fart jokes,lines about masturbating over people's mothers, and an erection is used as a compass - but amongst all the juvenile humour is something genuinely interesting. The corpse, dubbed Manny, is essentially experiencing life's journey all over again but much more rapidly. He begins unable to speak or communicate. then hits a teenage phase where he's obsessed with girls, and soon he's discussing love and society before eventually talking about how he longs for death. While the silly humour never lets up - and thankfully so, as it's handled rather well - Swiss Army Man doesn't take very long before it's landing sequences that are quite touching, finding intimate characters moments through misunderstandings and confusion over the world. 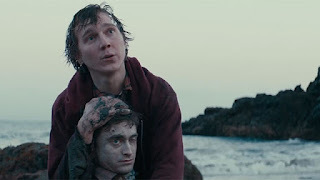 The film's script is first-rate, but most of Swiss Army Man's success comes through its cast. Dano is terrifically nuanced as Hank, and he works through his character's journey effectively, but the winner here is Radcliffe. In what is unquestionably the best performance of his career thus far, he tackles almost every emotion and feeling you can name and brings them to Manny's surface with determination and passion. It's tough to really care for a corpse, but Radcliffe makes this work. Swiss Army Man is stupid, there's no denying that, but once you get caught up in its journey you'll find something much more thoughtful at its core. To Summarise: Funny, inventive, and terrifically acted, Swiss Army Man works its way through a thoroughly ludicrous story and lands on something as surprisingly poignant as it is excitingly original. Over all, this has been a great little series. I've watched fifteen films: some of them were great (Victoria, Everybody Wants Some!! ), some of there were poor (The Shallows), and some of them were straight up alright (Equals, Captain Fantastic). It's been worth it, though. So, here again are all the films I've caught up on over the last few weeks, and their respective grades. Enjoy! Yes to Swiss Army Man! Great film! I really didn't expect to love it as much as I did, so good!